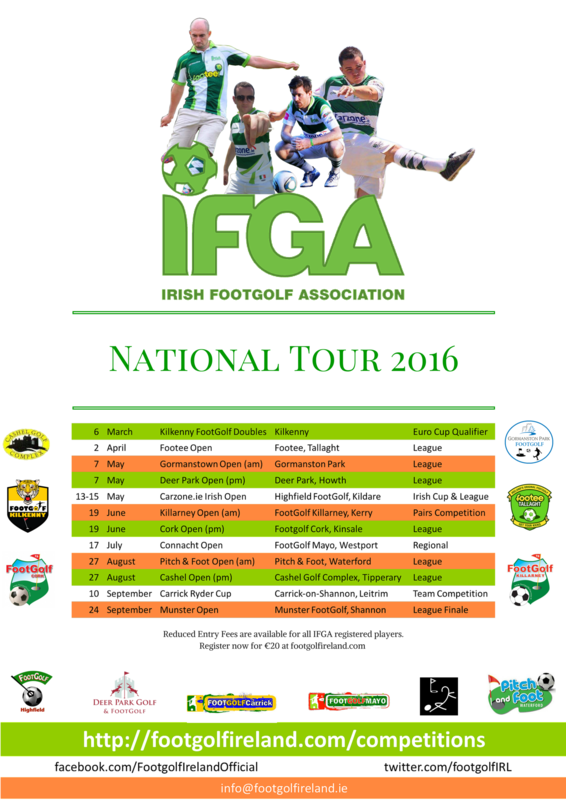 The calendar for the 2016 Irish Footgolf League has been confirmed. The season kicks off in style this Sunday, March the 6th at Footgolf Kilkenny where the first Doubles Competition takes place to decide which pairing will join Team Ireland for the EuroCup in France. ‘Footee’ will then host Round 1 of an 8-stage League with further team competitions at Footgolf Killarney and Footgolf Carrick. Footgolf Mayo will host the first Regional competition, the Connaught Cup with a first prize of €500. Other features will include a €25 rolling Hole-In-One jackpot, the Leinster Loot & the Munster Moolah jackpots (details to be announced soon).